PlumoWeb is a disturbing application. It is presented as a beneficial browser extension; however, malware researchers suggest that it can be the reason your operating system is infected with different infections. Once installed, the program connects to remote advertising servers and enables different online ads and offers to show up primarily on shopping sites. If these offers are presented by unreliable parties, there is a chance that you will be exposed to different virtual risks, and so PlumoWeb removal is strongly advised. 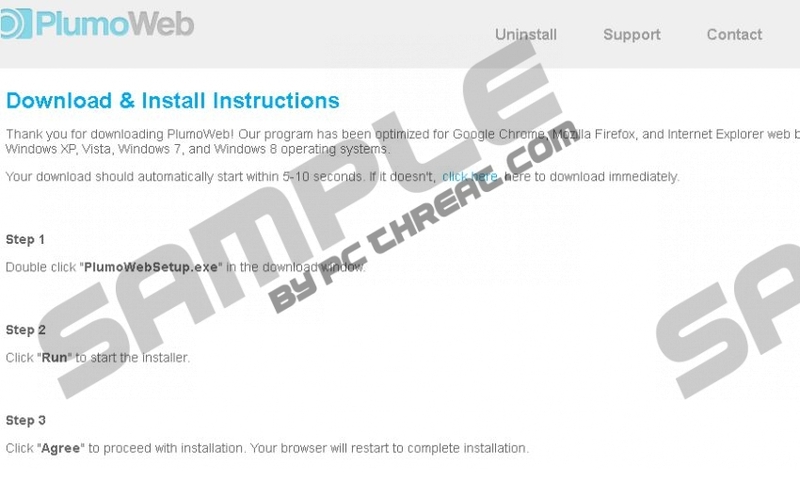 Not all computer users realize that PlumoWeb is an unreliable program; however, malware researchers suspect this just by looking at the official download page plumoweb.net. First of all, the download link does not work, which suggests that the application may be installed bundled with third-party applications which you need to delete to ensure virtual security. Secondly, the interface of this download page is identical to the pages representing such SuperWeb LLC apps as Grassmow, BrowsePro and AppSuper. All of these require urgent removal. There is no doubt that PlumoWeb is an advertisement-supported program; however, this is not what should worry you. The real risks are related to the parties representing these advertisements. If you do not know which parties are affiliated, you cannot trust the offers and suggestions that may be presented to you. As mentioned before, it is possible that unreliable parties will get involved as well. In the worst case scenario, these parties could present malware installers. If you launch them, your PC could get infected with threats that you will need to remove. Needless to say, getting PlumoWeb deleted is difficult enough, and you do not need to burden yourself with the removal of other potentially malicious programs. Even if you avoid PlumoWeb ads, your virtual security will remain vulnerable unless you delete this ad-supported program. The application runs web cookies, some of which belong to third parties. You can remove these cookies individually to stop unreliable parties from tracking your virtual activity; however, we recommend that you delete PlumoWeb with all of its components altogether. We recommend installing automatic malware removal software to erase the program together with all malign components and potentially dangerous third-party applications. Those who choose the more complicated manual PlumoWeb removal need to start with the instructions below. As soon as the program is uninstalled, you have to check the system for remaining leftovers and any additional threats. Use a malware scanner to identify these threats and then delete them. Employ a reliable malware removal tool to delete more complicated and clandestine infections. In the menu select Control Panel and double-click Add or Remove Programs. Find the unwanted program and Remove it from the Change or Remove Programs list. Navigate to the left of the Task Bar and open click the Start/Windows icon. Quick & tested solution for PlumoWeb removal.